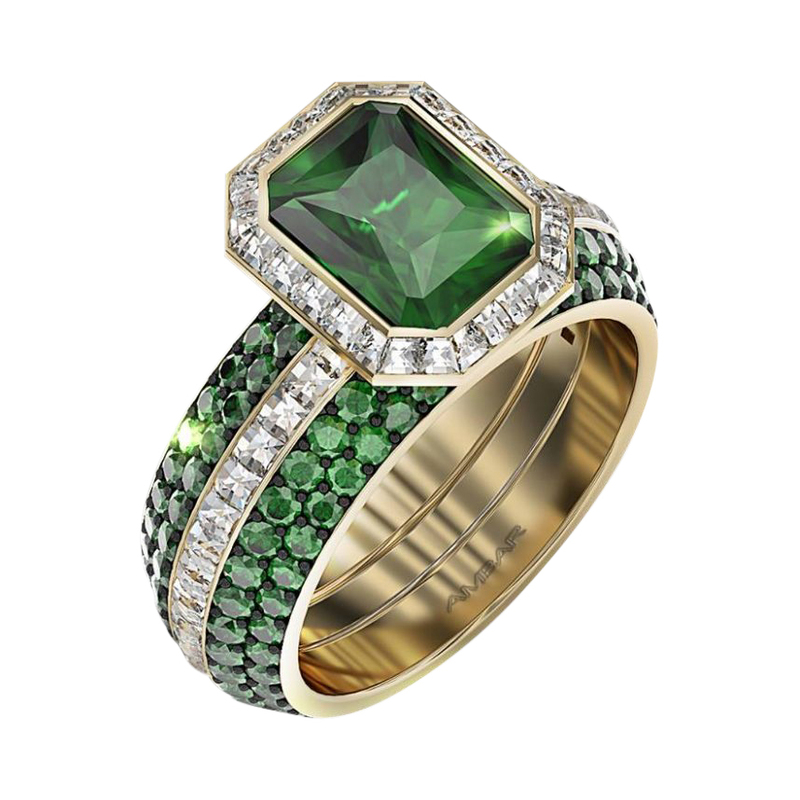 Why Should You Buy Emerald Engagement Rings? The Emerald is one of my favorite stones. A high quality Emerald has a deep green color that I can look at for hours. The Emerald is so prized, that carat for carat, a fine emerald may be two to three times as valuable as a diamond. People’s fascination with Emeralds might be related to its beautiful color or to what the word symbolizes. It is known as the “Stone of Successful Love,” opening and nurturing the heart and the Heart Chakra. Its soothing energy provides healing to all levels of the being, bringing freshness and vitality to the spirit. A stone of inspiration and infinite patience, it embodies unity, compassion and unconditional love. Many couples that come to us inquire about emerald engagement rings and Bez Ambar has some incredible Emerald engagement ring designs. The most valuable emeralds are a vivid green, with a concentrated pure hue which does not include traces of other shades such as brown or yellow. Emeralds are relatively hard stones, but most of them have many inclusions which can affect their toughness. All of the inclusions cause the stone to be much more fragile than other precious gemstones. To hide the many inclusions and imperfections natural emeralds undergo treatment. A green-tinted oil is used, to fill in any cracks and reinforce the emerald against unintentional chipping or splintering. As I mentioned before, even- though Emeralds are hard they are inherently brittle. They chip crack and scratch more easily than diamonds, rubies or sapphires. Engagement rings are rings that women wear everyday all day. If you have purchase a treated stone, due to normal wearing (washing hands, exposure to cleaning chemicals, etc. ), the oil treatment the stone went trough wears off and more imperfections become visible. A stone that looked beautiful when bought will suddenly look less appealing. Since no woman want to wear a chipped, scratched, severely included, you have to be ready to replace the stone every few years. If you are looking at emerald engagement rings, for yourself or significant other, keep their brittleness and potential treatment in mind. Even though all the emeralds we provide are natural non-treated emeralds I recommend to go with emeralds as an accent stone and use a less brittle stone as the center, unless you are prepared for more frequent than usual engagement ring maintenance.